Offset has released his debut solo single. The Migos star dropped the track 'Red Room' from his forthcoming album and documentary, which is released on February 22. RED ROOM SONG AND VIDEO COME OUT TONIGHT. My first solo project I want to express my life let my fans know a little more about myself and of course some turn up !!! RED ROOM OUT TONIGHT #RedRoom (sic)"
his wife Cardi B giving birth to their seven-month-old daughter Kulture. The trap star used a clip from the hospital room, which sees his wife pushing out their little girl, who was born on July 10, 2018, as he stood by her bedside. The 'Bodak Yellow' hitmaker can be heard letting out a deafening scream as she delivered their first child, before it ends with the rapper standing near to the door of the room with a seemingly concerned look on his face. D O C U M E N T A R Y: 2-22-19 (sic)"
The video also has footage of Offset in the recording studio and him FaceTiming his son in a car. The solo record was originally set for release on February 14, but was delayed after Cardi and Offset briefly split up. 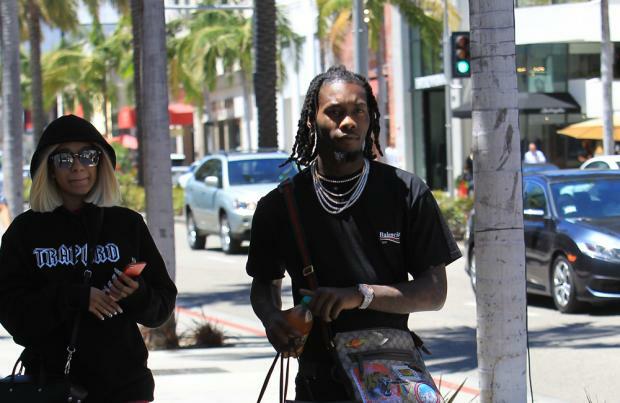 The "playlist" is set to address Offset's car crash in May and his marriage. He said previously: "I'm not really talking too much about Pateks and Lambos because it's not relatable. "That's almost like bubblegum rap now, how the people are accepting it. They just get two days of playing it, then it's over with. This can last and people can feel it .. I'm really pushing my album to be a playlist and not an album, because a playlist is consistently being played for moves, exercises, and different things." saying thank you because she's my daughter. It's because, you know, when I found out I was pregnant, my album was not complete. "I had like, three songs that I was for sure having -- you know how it was. We was like, 'We have to get this album done so I could shoot the videos while I'm still not showing. It was very long nights." The rapper ended her speech by praising her spouse. She said: "He was like 'you gonna have this baby, and you gonna make this album.'"